Sarah Bush, Artistic Director of Sarah Bush Dance Project, discusses her new Rocked By Women show, opening this weekend at Dance Mission Theater, May 9-11, 2014. 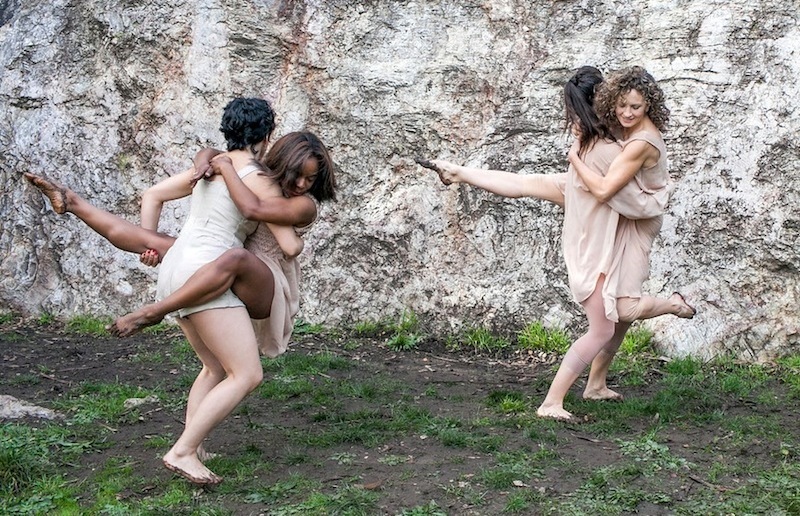 Brittany Delany (BD): Can you talk about your dance company mission–’empowerment through art’? Sarah Bush (SB): For me it’s important to be creating work that shows women as strong, well-rounded, full characters on stage. And I think we’ve all had the experience of going to see dance performance where that’s not the case. Often that’s true in ballet and different styles of dance where I don’t feel like I get to connect to the women on stage, or relate to their experiences. My experiences are not reflected on stage. I appreciate getting to work with women artists; teach them, encourage them; explore their strength, explore their expression. Encourage that in rehearsal process, in classes and then in performing the work…encouraging a lot of floor work in the choreography, a lot of partnering work: lifting and supporting each other–literally and figuratively–so that in and of itself is a powerful practice. Sometimes I think it’s leading by example of just living what feels true to me and my life experience and the women whom I’ve known in my life–showing all of that; those stories. BD: What are the stories in Rocked By Women? SB: The stories in the ‘Rocked By Women’ show are of feminist leaders and women musicians in the women’s music movement. Also, this show in particular is somewhat autobiographical–following some of my life experience and abstracting some of that in to fiction. It’s showing pieces of my life around first love, first crush, first coming out, and telling a lot of lesbian life stories and experiences. All these stories are stories that can get forgotten and aren’t always given voice to in the performing arts. BD: How would you describe some of this dancing that we will see in the show? SB: Well all of my dancers have training in ballet, as well as in contemporary and modern dance. And then a lot of us have experience in varying degrees in other styles as well: Hip Hop, Afro-Caribbean, Afro-Haitian, Contact Improvisation, Jazz–which make for a really rich blend of movement and I think there’s a different quality of performance within each of those styles. For ‘Rocked By Women’, we’ve been working with a Becca Wolff, a theater director. She has brought great craft of storytelling and theatricality to the show. So I’m very grateful for that. It’s brought out a particular aspect that I believe is in my work already, and really highlighting the acting component that can be possible with dance. That’s so important to me: showing the human emotion and expressing the storytelling through dancers’ face, eyes, gestures — that makes the movement more human and accessible to audiences and more emotionally poignant as well. BD: What do you think about breaking down certain stereotypes in dance? SB: I don’t know if it’s a stereotype or an archetype, but women, often in dance styles, will be portrayed for “feminine” qualities of softness or seductiveness and sexuality or sensuality. And there are a lot of women in the world who don’t experience their bodies in only those categories. My personal life story and representation of the women whose stories we’re telling through this show– women feminist leaders, the women who built the Michigan Womyn’s Music Festival, the women who built Olivia records, different performers– many of these women don’t fit that stereotype. For example, a stereotype from a magazine image of femininity: long flowing hair, outfits that accentuate your curves, high heels and whatever our culture has defined that is feminine. Most of the women in my life don’t fall in to that category. I don’t fall in to that category. So, in breaking down stereotypes, we are showing women in so many other ways, other ways of dress, other ways of body language, other ways of connecting and relating to the world.